This section considers factors involved in the initiation of a process that forces heat out of a water body, for example, the sea, a bathtub, or soup in a cup. The more a “hot soup” is stirred, the more steam goes up in the air and the quicker the soup cools down to convenient eating temperatures. In oceans and seas the most effective external force to ‘stir’ the water is wind. Internal forcesare horizontal or vertical currents. War at sea can have a similar effect. In late 1939 oceans and seas in Northern Europe were treated exactly like any hot soup. Release of heat and vapour from the sea is the nucleus for the making of weather. Stirring the waters of the Atlantic and the formation of Atlantic cyclones might have influenced the weather. The fact is that the centre of low air pressure went from its statistically usual place south of Iceland in autumn 1939 (October-November) towards Scotland, 1,000 kilometres further east. Stirring the sea area after a warm-up period in summer inevitably will increase evaporation. As the North Sea and waters around Britain saw most of the ‘war at sea’, a significant impact on the location of a low-pressure centre cannot be ignored. This statistical centre mightbe the result of cyclonic activities, which usually ‘squeeze’ heat out of the sea, and result inincreased evaporation conditions in the North Sea, or wherever stir and shake of sea took place. Has the war at sea initiated, influenced, or supported this process? Thissection provides some examples for consideration. The weather produced some surprises during the first few months of war in late 1939. The ‘stirring of the sea effect’ is vaguely reminiscent of the ‘butterfly effect’. Thisthesis suggests that if a butterfly flaps its wings in one part of the world, it can cause a storm in another part. More precisely, flapping of the wings produces a tiny change in the status of the atmosphere that, over time, can result in a much larger effect elsewhere. This effect isoften used in connection with the “chaos theory”, which assumes that the atmosphere is fundamentally chaotic. As such, it is said, it is inherently unpredictable. There is noreason to question the ‘endless chain of causes’ for change in weather patterns. This investigation, however, is based on the assumption that oceans and seas dominate atmospheric processes. It defines climate as the continuation of oceans by other means’, . As the war at sea in Europe’s home waters and out in the North Atlantic turned over a lot of sea, it can be assumed thatthe war at sea may have set atmospheric processes in motion. The case of the ‘steaming hot soup’ is mentioned as an example in an attempt to explain the ‘practical’ interactionbetween water surfaces and atmosphere. While full thermo-dynamical processes of heat (energy) exchange, radiation, conduction, and evaporation, are highly complex, the basics remain simple. Evaporation depends on the difference between the partial pressure of water vapour in the air and the vapour pressure of seawater. The greater the temperature difference between water and air, the greater energy exchange will take place. In the North Atlantic (between latitude 50-70°N) the exchange of energy, as compared to summer period (June – August), is 3-4 times higher during autumn, and 4-5 times higher in winter. The difference will be greatest when the sea is warm and the air is cold and dry (period from autumn to end of winter). On the average, 100 grams of water areevaporated per year per square centimetre of ocean surface. It takes nearly 600 calories of heat (energy) to evaporate 1 gram of water. Actually, water is an excellent isolator. Oncestored, heat is ‘safe and sound’ as long as it does not come into immediate contact with the atmosphere at the sea surface. Though this can happen on numerous physical conditions, one of the most effective methods is the stirring, mixing, or ‘turning upside-down’ of upper seawater layers, as is particularly done by winds generated by cyclones and anti-cyclone systems. Within one or two days a forceful gale can ‘squeeze’ heat energy out of the surface waterlayer, which may have been retained by a smooth surface for many days or even weeks. Analysing reasons for the two major climatic changes during the 20th century, both of them in closest proximity totwo World Wars, the following two examples e.g. turning the bathtub water around to get the right temperature for bathing the baby, or stirring the soup to eatable temperatures, provide a basic explanation on the interaction between sea and atmosphere. Further details: (A) Ocean at war, 4_11; Sea system effected, 4_12. A mine sank a German destroyer near the entrance of theKattegat in a mine field by a “detonation that was especially heavy as the destroyer was loaded with mines”. (NYT, 12September 1939). Only a day earlier the German government had revealed that three entrance zones to the Baltic had been mined. (NYT, 11September 1939). Dutch freighter, 1,514 tons Markwas lost when it rammed againsta mine in the North Sea 120 miles west of Vorupoer, Denmark, (NYT, 12 September 1939). Two British destroyers Eskand Express were laying sea minesin the German Bight. Submarines sank 7 ships in 2 days. (NYT, 11 September 1939). On 11th September, the low pressure was close tothe entrance to Skagerrak. How much have the above mentionedevents influenced the formation/location of this low pressure? Later on, this low pressure (1,000mb) moved from west of Jutland, southwards to the Hoek van Holland area (12th), and then to Oostende/Belgium (13th). 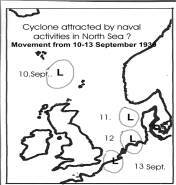 The movement of this low pressure through the North Sea may actually have something to do with activities along the “Westwall”, where a dozen or more German Naval vessels were laying many thousands of sea mines. On 15th, at8a.m., there wasa small low-pressure centre (1,005 mb) north of Helgoland close to large sea mine fields. Off the Danish coast: “while pilot took US Mormachawk safely through (German) mines, with Danish and Greek merchant vessels tagging behind, American vessel’s helmsman grew increasingly jittery as five loose mines blew up 500 to 800 yards away from it. The motor ship heard later that a loose mine had struck the pilotless Greek steamer Kosti, going through the field behind it”. (NYT, 20 September 1939). Off Jutland coast: British cruisers hunting submarinesin the North Sea (near Jutland) fought off German bombers. Bombers attacked repeatedly and anti-aircraft guns returned fire from decks of warships”. (NYT, 10October 1939). Six bombs had hit the British cruisers, one bomber crashed intothe sea, ithas been claimed. (NYT, 11October 1939). A bomb normally has a weight ofeither 500 or 1,000 pounds. “Nazi warships used decoysto lure the British fleet into position for air attacksoff the Norwegian coast. Two 35,000 ton battleships, five heavy cruisers and a number of lighter ships set out from their base in pursuit. A witness to thisbattle saw 150 planes. “There must have been at least 50 planes. More than 100 bombs were dropped”. (NYT, 13October 1939). A German flotilla sailing to the Norwegian south coast (8-10 October) was headed by battleship Gneisenau andaccompanied by cruiser Koeln and nine destroyers. Off Copenhagen shore: “Gales have loosened several hundred mines in the German mine field… drifting mines exploded on the coast near the suburbs (of Copenhagen), breaking windows and frightening citizens with terrific detonations. Marine crews have destroyed no fewer than forty-three mines from Koege Bay up to Amager Island, where about 100,000 Copenhagen residents live in a district comparable to Brooklyn. Along the whole southern coast, mine alarms often make it necessary to evacuate villageswhile experts empty or explode the mines. So many mines are floating around that it is impossible in the bad weather to destroy all of them.” (NYT, 6 November 1939). On 21 October and 25November 1939, German mines sank two German Coast Guard ships south of the Great Belt (Denmark); one of the ships exploded. (NYT, 26 November 1939). Main features of thisstory can be narrated briefly. On 10October 1939, New York experienced the hottest October day on record. (NYT, 11October 1939, p.26 – Commentary). Two days later a hurricane formed east of The Antilles. It took a north-north-easterly course on the 15th, intensifying rapidly. After passing the Bermudas at noon on 16th, the cyclone rushed with hurricane winds towards Cape Race/ Newfoundland, reaching a sea area in the North Atlantic on 17th that saw dozens of naval vessels in action. The hurricane was so fast and its course so erratic that the US Weather Bureau was unable to provide any warnings about the storm. (NYT, 19October 1939). Another ‘surprise’ for the people of New York was the coldest weather on the 17th October, since the last winter, because steadily falling temperaturesapproached freezing point. (NYT, 18th October 1939). This wasa record low for this season in New York and also in many other parts of the United States. (NYT, 19October 1939). How could this happen? 10October 1939 was the hottest day on record, and only 8 days later on October 17 there were record low temperatures. In 1939, there was only one major hurricane. It travelled in just 3 days (16th to 19th October)from the Bermudas to an area south of Greenland athigh speed and further upto an area in the North Atlantic where the British Northern Patrol wasactive, as was a German submarine group of six. They sank eight vessels between 9th and 16th October. The pocket battleship Deutschland was active, and first convoys eastward and westward were on their way along with naval escorts. The British were active in laying a mine barrage on Faroe ridge from Faroe Island to Iceland. There were certainly even more activities that may have contributed to the “stirring up” of the sea surface thus giving the Atlantic air some vapour ‘to work with’. The first sea engagement of naval surface vessels in the North Atlantic occurred in late November 1939. This naval encounterwas immediately followedby a rapid decrease inair pressure by more than 50 mb in 48 hours. Can a 15 minutes’ shelling of 600-pound shells produce sufficient ‘butterfly-effect’ to turn amodest low air pressure into a violent cyclone? Weather was fair on Thursday the 23rd November 1939, Southeast of Iceland, about 200 miles west of the Faroe Island. The big and modern German battleships Gneisenau and Scharnhorst sailed in a flotilla of six naval vessels, when they saw HM Armed Merchant Cruiser Rawalpindi atsome distance. The sea was smooth in the late afternoon over a distance of about 7,500 metres, clear enough for the enemies to shell each other, when a tremendous explosion broke the merchant cruiser in two. A shell from one of Scharnhorst’s 11-inch guns had hit the Rawalpindi’s forward magazine. The Royal Navy ordered all of their Home Fleet (ca. 20 big naval vessels) to sail to the scene of action to hunt the German flotilla. But a squall arose and the Germanships escaped in stormy weather. The 16,697-ton Rawalpindi wasnomatch for the 38,900-ton battleships each. The German battleship Scharnhorst fired the first salvo over adistance of 10,000 yards (NYT, 28 November 1939), but when the enemy loomed large Rawalpindi sought protection by dropping smoke floats into the sea and in her defence, replied with all her four starboard six-inch (100-pound) guns. (NYT, ditto). That was by far too little against the 11-inch (600-pound) shells German battleships could launch from their six gunsin minute intervals. The battle was over at about 16-30 hours GMT. Germans took 28 survivors on board, from a total of only 39, anddeparted immediately beforethe first British cruiser (HMS Newcastle) arrived at the scene. “However, the other eleven crew members who had also escaped from the blazing ship were rescued byanother British naval vessel. Thoseeleven wholanded at Glasgow told the story of the battle. The Rawalpindi burntuntil eight o’clock Thursday night, they said, when she capsized onstarboard side with all remaining crew(238 men). The cruiser attempted to follow German ships but weather was on the Germanside. Heavy rain and nightfall served as a shielding curtain between German raiders and the British warship”. (NYT, 28 November 1939). Probably rain may have comedown due to the shoot out and the squall that arose could have comefrom the Atlantic water that was ‘stirred’ and ‘turned’ at the scenes of action. Actually, within 24 hours of this occurrence,a low pressure (975 mb) appeared south of Iceland. 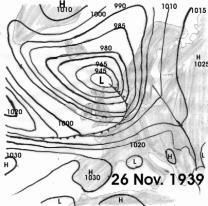 In the early morning hours of 25November 1939, the air pressure over Iceland fell by more than 8 mb in three hours. The cyclone moved to the Orkney Islands and was down to 945 mb on 26November. This was a weather development not everyone would have predicted. But in the late autumn the Northern Atlantic is extremely sensitiveand the weather depends on conditions of the sea surface. Example 5 – Arctic Christmas cyclone - 21-26 December, 1939 – connected to the war? Sunday, 24 December, 8 a.m., 980 mb, ca. 100 miles south of Leningrad. What triggered the development of this exceptional cyclone in the first place? Heavy fighting between Finnish and Russian forces took place in the North-East and less than 300 miles away from where the new cyclone developed on 20December1939. It covered a frontage of 1,000 kilometres, stretching from the Barents Sea to the Gulf of Finland in the Baltic Sea. How many or how intensive military manoeuvres does it take to initiate or reinforce atmospheric events? 19 December – “The Finns are using improvised tank bombs like those devised in the Spanish civil war, a combination of hand grenades and small gasoline cans”. 20 December – “The Russian drive was stalled in the far north by blizzards and temperatures 25 degrees below zero (minus 31° C)”. (NYT, 21 December 1939). 20 December – “Fierce fighting surged across Karelish Isthmus in sub-zero temperatures (below minus 17.8° C) today as the Russians losthundreds of tanks in savage fightingand directed 200 Red Air Force planes in widespread bombing attacks on the rest of Finland. The roar of artillery could be heard from one side of the 65-mile-wide Isthmus to the other. Finnish aviation rose to meet Red Army aviators in fierce dog-fights and battlesin the winter sky. ‘Much of the time I was unable to distinguish one plane from another. In zero cold the exhausts of the planes left comet-like streams, smoke trailingbehind them for, as long as ten to fifteen miles occasionally’”. (NYT, 21 December 1939). 21 December – “Russians Retreat in Arctic from Finns, Cold and Snow”; “By mid-afternoon the Finns fighting in heavy snowstorm and sub-zero cold (Fahrenheit) were reported.” (NYT, 22 December 1939). Further details: Russian-Finnish war, 2_41. The list above presents only a very small number of events that actually took place in Finland, in the Barents Sea and in the Norwegian Sea where the new low-pressure centre originated from 19th to 21st December 1939. From quite a number of cyclones, only features (development, strength, movement) of five lows in close context to military activities have been highlighted. It seems difficult to categorically deny any impact of the war at sea on the composition of atmospheric air pressure; it certainly had. In September 1939 whenWarsaw was in flames, exploding sea mines and the sinking ofocean liners forced cold water to the sea surface the air temperatures wouldhave changed and subsequently the air pressure would have followed suit. Although the examples given abovein no way allow a final conclusion to be drawn on how each of these events contributed precisely to the forthcoming arctic winter in Northern Europe, the circumstances indicate that they should not be ignored. The sinking of the Rawalpindi was tragic, but in military terms it was “a small event”. Nevertheless, circumstances indicate that 11-inch-salvoes by the Scharnhorst and the Home Fleet rushing to the scene, may have triggered the developmentof a cyclone, eitherby hastening it by a couple of hours, orby making it slightly more violent, or by letting it movea little further. After all, cannons of a battleship are obviously more effective than the flap of a butterfly’s wing. At least, the impact of an 11-inch shell is easier to detect. An exploding 600-pound shell is not necessarily a ‘fundamentally chaotic’ event for the sea and subsequently the air temperature.